The ethics panel in the House of Representatives on Friday demanded records of all settlements for sexual harassment in the lower chamber of Congress. The announcement comes amid mounting allegations of sexual misconduct in politics and intense scrutiny over how such claims are handled on Capitol Hill. It emerged last month that accusations of sexual harassment in Congress are overseen by the little-known Office of Compliance, which over two decades used roughly $17m in taxpayer dollars to pay out settlements and awards to federal employees. 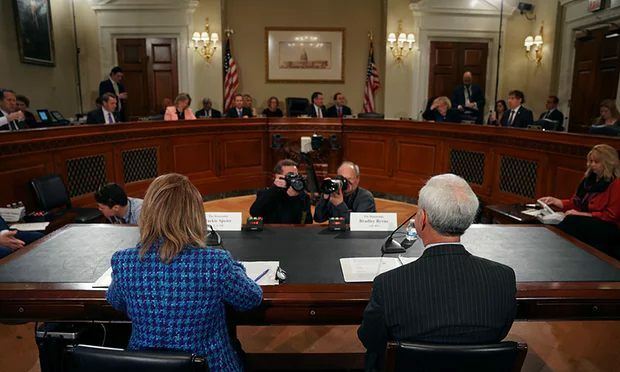 On Friday, leaders on the House ethics committee called on the Office of Compliance to “promptly” hand over “all records ... related to any claims of sexual harassment, discrimination, retaliation, or any other employment practice” prohibited under federal law. “Sexual harassment and employment discrimination are prohibited in the House of Representatives,” Susan Brooks, the Republican chairwoman of the committee, and ranking Democratic member Ted Deutch, wrote. The request for records applies not only to members of Congress, but also staffers and other officers employed in the House of Representatives. The issue of sexual harassment settlements boiled to the surface earlier this month when it was revealed John Conyers, a Democrat from Michigan, quietly agreed to settle a claim by a former employee that she was fired for refusing his sexual advances. The former staffer was “rehired” as a temporary employee and paid more than $27,000 from Conyers’ congressional office budget, in what was made to look like ordinary payroll. After initially defending Conyers’ legacy, House Democratic leader Nancy Pelosi on Thursday called on the congressman to resign. Conyers, who is the longest-serving member of Congress, has insisted he is innocent even while a second woman came forward to accuse him of misconduct. Senator Al Franken, a Democrat from Minnesota, has also faced allegations from several women of inappropriate sexual behavior. Two women have said he attempted to forcibly kiss them, while a host others have accused Franken of grabbing their buttocks. The encounters range from before Franken’s time in elected office to when he was already a sitting US senator. Roy Moore, the Republican Senate candidate in Alabama, has been accused by multiple women of sexual assault. Some of the accusers claim Moore, a former judge, molested them when they were teenagers. The allegations have been bolstered by a period of reckoning around sexual assault, with powerful men across entertainment and media losing their jobs following reports of widespread misconduct – often over a period of years. But the careers of politicians who stand accused of sexual harassment have yet to suffer the same fate. Conyers and Franken have thus far declined to resign, saying instead they will cooperate with separate investigations led by the House and Senate ethics committees. Even as Republican lawmakers called on Moore to step aside from the Alabama Senate race, he drew the support of Donald Trump, who has himself been accused of sexual assault by numerous women. It was also revealed on Friday that Blake Farenthold, a Republican congressman from Texas, used taxpayers’ money to settle a sexual harassment claim brought by his former spokeswoman. According to a report published in Politico, Farenthold was sued in 2014 by Lauren Greene, then his communications director, over allegations of sexual harassment and gender discrimination. Greene also accused Farenthold of creating a hostile work environment and firing her after she complained about his behavior. Although Greene filed a lawsuit in the US district court in the District of Columbia, she dropped the case after reaching a private settlement with the congressman. Gregg Harper, the chairman of the House Administration Committee, has said the Office of Compliance account was only used once by the House office in the past five years, to settle a sexual harassment complaint amounting to $84,000. Neither Farenthold nor Greene’s lawyer would confirm if their case was the $84,000 settlement in question, Politico reported. The House and Senate both approved resolutions in recent weeks requiring anti-sexual harassment and anti-discrimination training for all members of Congress and staff. House speaker Paul Ryan said on Friday federal lawmakers should be held to a “high standard” while noting the 1995 law that paved the way for secret settlements “needs to be updated and upgraded”. “I think we’re all realizing that sexual harassment in America is absolutely pervasive and it’s got to go and we need to end it,” Ryan told NPR. Ryan struggled, however, to say why the allegations against Trump were not being treated as seriously as those against Moore and others. “I haven’t spent my time reviewing the difference in these two cases,” he said. “Roy Moore is trying to come to Congress.